Last time we discussed cards to ignore that included Win-More and Lose-Less types of cards. We also examined when there were exceptions to the rule of ignoring them (such as how Dragonstorm wouldn't be a successful card in a typical Dragon deck but someone was able to build a combo deck around the card for tournament play). Today we'll be looking at "Punisher" cards (that would be their unofficial nickname). Dash Hopes is a prime example of this type of card. When looking at the card it seems like it's incredibly powerful. Two mana to counter a spell is the cheapest type of hard counter that Blue can create and here it is in Black. Two mana to make an opponent lose 5 life is also a lot of bang for your buck. Red can't even do 5 damage for 2 mana with burn spells. So on the surface it seems like this is too good to be true. The importance of a "hard counter" is that it will stop your opponent from playing a key spell. The importance of a burn/loss of life spell is that you you're dropping their life total down to achieve victory. When you give your opponent the option of choosing one or the other (which is what this spell does), then they're always going to pick the option that doesn't matter to them. If they play a finisher that will win them the game and you cast Dash Hopes, they'll just take the loss of life and win. If they play something they don't need then they'll just take the counter option and you will have traded one spell for another. It's always an option that gives them the most benefit and it never generates actual card advantage. 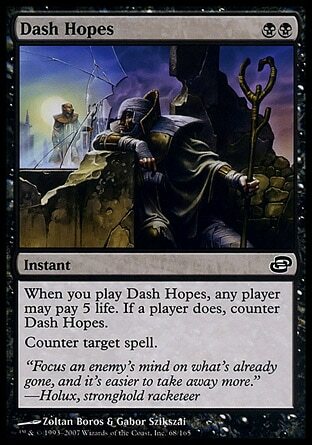 Dash Hopes only has one moment where it's useful: when the opponent is at 5 or less life, you're already winning, and they're trying to cast a spell that would win them the game. That's oddly specific and we're still talking about a scenario that doesn't generate any card advantage or get you any closer to winning the actual game. This is very similar to the problem that Lose-Less cards have (which we talked about last time). These cards will help you lose-less in very specific situations but they aren't helping you win the game and there are other options out there that can take the place of these cards. It's important once again to explain that in Magic the Gathering there are always exceptions to every rule. Some decks can abuse the downside of certain options to make a card useful 100% of the time. The problem with Dash Hopes is that the very deck that can abuse it the most is also just a very ineffective deck. Remember that all decks can fall into three categories: aggro, control, and combo. -Aggro decks shouldn't be leaving mana open to play reactively when they could be casting threats. An aggro deck that attempts to play reactively will only be slowing itself down and giving the opponent more chances. -Control decks aren't able to use it to control the state of the game when they need it most and it doesn't generate card advantage. A control deck doesn't concern itself with racing the clock (trying to deal direct damage) because it gets an advantage the longer a game lasts. -Combo decks just aren't going to look at this (to be fair, they aren't going to look at most cards). So you would need a mono-black aggro/control hybrid that wants to shutdown cards while forcing life loss via threats that can also amplify how devastating the life loss actually is and having a reason to have permission cards simultaneously. You could build it but you'd be building a deck that's shooting itself in the foot. That's the other problem associated with these types of cards. Let's look at another example: Breaking Point. 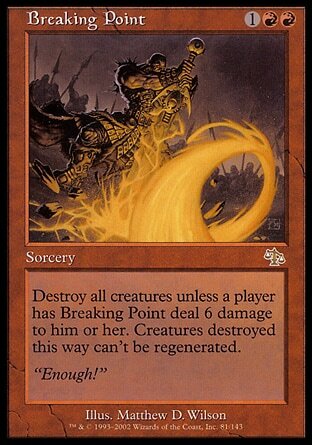 Breaking Point is interesting because a common deck type already exists for it. I'm pretty sure most Magic players have heard of or seen a "burn" deck at some point. This is a card that can deal 6 damage for 3 mana (that's better than almost any other burn spell in the game) or wipe out all creatures on the board which is always useful for a burn deck. The problem comes in giving the opponent the choice. -If you play it in the early game, they will choose the creature wipe for two reasons. They won't be losing a lot of creatures (or any of their main threats) and they will be keeping you from dealing damage. Remember that a burn deck needs to deal damage every turn to win the game as fast as possible or else it loses the match because it has no staying power. -If you play it in the mid to late game, they will take the damage because they know that they're going to win with their creatures when they swing next turn and you won't be able to stop them. Once again it comes down to a very specific scenario for it to be useful: they have 6 or less life, you're already winning, and they have no backup plan for their creatures being wiped (as in, they over-commited and have no cards in hand, they don't have a way to get them back, they don't have a spell that could protect them, and yadda yadda yadda). Even in that scenario, the best case scenario for playing this card, you could have just had a burn spell in your hand anyways and just outright won the game. Let's end with a punisher card that seems to know what it's doing: Temporal Extortion. The biggest reason this card actually works is that the two choices aren't at opposite ends of the spectrum. That's the key. Imagine this scenario: you're playing an aggro deck and you cast this spell. Your opponent can either choose to let you get the extra turn (letting you swing with your aggro deck for yet another turn on top of the card draw and extra main phases which is better than casting Overrun) or take a huge chunk of life-loss which is what the aggro deck wants anyways. 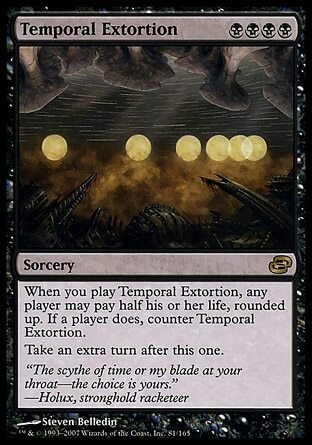 Unlike the cards mentioned earlier, the options your opponent has when you cast Temporal Extortion is either Damage or Damage. It's a win/win situation every time for an aggro deck. Bottom line: if you really want a punisher card for your deck, go with one that you can utilize that will never force you to make a bad play. Make sure that no matter the scenario, it's consistently a useful card for your deck and both options work for you 100% of the time. This is Kylak signing out because it's the best option after typing this wall of text.